An unusual and creative keepsake gift for Shakespeare lovers. An ideal way to mark an occasion, remind someone of a special memory or just to have as an unique piece of artwork. It would also make an ideal wedding gift. 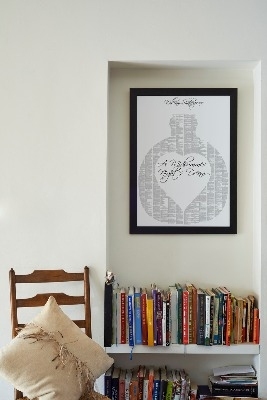 The whole of Shakespeare's play is on this bold art print. As with all Spineless Classic prints the text is pin sharp and, up close, you can read the full and complete play of A Midsummer Night's Dream. What a wonderful piece of art to bring back memories of a play you loved (or even appeared in!) and happy times. A young student might like the idea of re-reading this play a scene at a time every time they walk past it on the wall! For those not familiar with the story, it is a magical concoction of a play. A Midsummer Night's Dream brings us Shakespeare at his lyrical, whimsical best. Laden with wordplay and just enough dramatic excitement to carry us away on a fantastical adventure of fairy Kings, this is a tale of plays-within-plays and powerful love potions. Don't trust your eyes; follow your dreams. Produced by Spinless Classics this poster contains the full text of the play. Where there are shapes in the design, the words wrap to the edges rather than being removed or shaded. The apparent font size is roughly 4 point which is perfectly legible with the naked eye if you have 20/20 vision, or with light magnification if you don't.